Sunspots and solar flux values dropped this week after a rise the week prior. Average daily sunspot numbers were down nearly 72 points, while average daily solar flux values were down nearly 21 points. Solar flux is expected to decline, dropping below 100 by Sunday, April 13. It should reach a minimum around 85 from April 16-17. A solar flux value of 85 is about equivalent to a nominal sunspot number of 28.7. Solar flux at 70 or below is generally what you see when the sunspot count is 0. 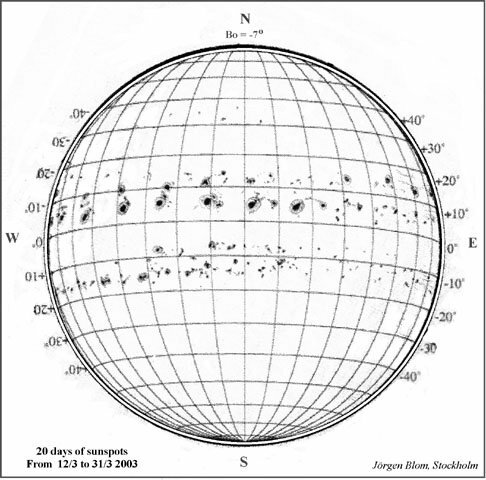 For instance, for over a month from September 13 to October 20, 1996 the sunspot number was 0 every day. Solar flux during this period ranged from 66.4 to 70. On Monday of this week helioseismic holography revealed a large sunspot group forming on the sun's far side. This was another week with active geomagnetic conditions, although the planetary A index never went above 26. April 8 brought a brief G1 level geomagnetic storm caused by solar wind. On April 10 earth is entering another solar wind stream. The predicted planetary A index value for Friday is 20, followed by 15 for every day through April 19. Pat, W5OZI in Texas wrote last week to say he'd been hearing his own backscatter echoes from the south on 6-meters. He was working ZP6CW in Paraguay with the ZP6 beaming west. On April 4 Pat wrote, "Yesterday, was the same, highlighted by a QSO with 5W1SA in Western Samoa at 2202z followed an hour later with a quick QSO with ZL3TY." Spaceweather.com is showing a neat drawing of twenty days of a sunspot group's progression across the solar disk, from March 12 through March 31. See it at http://spaceweather.com/swpod2003/10apr03/blom.jpg. This web site is produced by Dr. Tony Williams, who has a new service out called Space Weather Phone. This service provides verbal alerts of space weather events, and you can set alert levels and times of day when it will call you concerning geomagnetic storms and aurora warnings. You can learn about it at http://www.spaceweatherphone.com. Here are some web sites we haven't mentioned in awhile. Check http://www.sec.noaa.gov/solar_images/index.html for an archive of solar images. For daily space weather, check http://www.sec.noaa.gov/SWN/ and http://spaceweather.com. For daily space weather alerts, check http://www.sec.noaa.gov/alerts/solar_indices.html. Sunspot numbers for April 3 through 9 were 154, 148, 94, 75, 77, 52, and 88, with a mean of 98.3. 10.7 cm flux was 155.7, 165.5, 137.4, 125.9, 115.6, 112.3, and 109.4, with a mean of 131.7. Estimated planetary A indices were 14, 26, 23, 9, 6, 20, and 25, with a mean of 17.6.